By Mikael Holter (Bloomberg) — Norway beat back an unprecedented lawsuit by environmental groups that sought to curb oil drilling in the country’s Arctic waters. The government acted lawfully in awarding exploration licenses in the Arctic Barents Sea to companies such as Statoil ASA and Chevron Corp. in 2016, Oslo District Court said in a ruling on Thursday. The risk of environmental damage from the government’s decision is “limited and remedial measures are sufficient,” the court said, also ordering the environmental groups to pay 580,000 kroner ($72,000) in court costs. 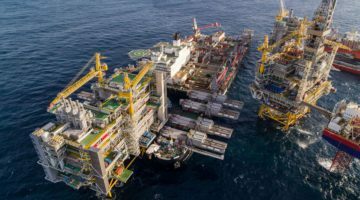 The result “was as expected, in the sense that our view has been that there have been good processes with regards to the 23rd licensing round, in line with the legislation,” Norwegian Oil and Energy Minister Terje Soviknes said in an interview Thursday. Greenpeace and Nature and Youth, a Norwegian environmental group, had sued the government, claiming it breached the constitution and acted contrary to the Nordic country’s commitment to fight climate change under the Paris Agreement. The group will decide later whether to appeal, Truls Gulowsen, head of Greenpeace in Norway, said in a message. “Some issues that the environmental organizations have raised fall outside what was tried by the court,” according to the ruling. “Whether Norway is doing enough for the environment and climate, and if it was sensible to open fields so far north and east” are questions “better assessed through political processes,” the court said. The lawsuit was the first of its kind in Norway and is part of a growing global trend of legal challenges against governments and companies for falling short on tackling climate change. Analysts said the suit was a long-shot, but that it could be a stepping stone to further legal challenges, which Greenpeace cited as one objective. The courtroom battle unfolded against a backdrop of growing skepticism toward the oil industry and, especially, its Arctic exploration. The industry’s future took center stage in the campaign for Norway’s parliamentary election last year, as voters increasingly question whether it makes moral or even financial sense to keep exploring for more fossil fuels. The country’s $1 trillion wealth fund, built from its offshore riches, last year proposed dumping oil and gas stocks to limit risks. Yet at the same time, Norway has pushed for more exploration in the Barents Sea, which is thought to hold half of the country’s undiscovered resources. The region is seen as key to limit a new drop in oil production in the middle of the next decade after it already fell by half since a 2000 peak.